T he Patriot Guard Riders is a 100% Volunteer, Federally registered 501(c)3 non-profit organization which ensures dignity and respect at memorial services honoring Fallen Military Heroes, First Responders and Honorably Discharged Veterans. 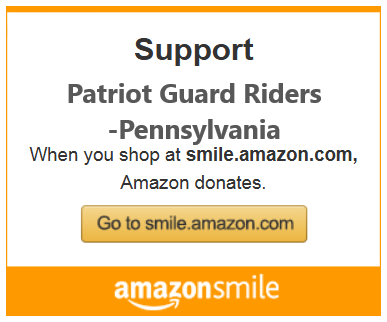 T he Patriot Guard Riders is a diverse amalgamation of riders from across the nation. We have one thing in common besides motorcycles. We have an unwavering respect for those who risk their very lives for America’s freedom and security including Fallen Military Heroes, First Responders and Honorably Discharged Veterans. If you share this respect, please join us. W e don’t care what you ride or if you ride, what your political views are, or whether you’re a hawk or a dove. It is not a requirement that you be a veteran. It doesn’t matter where you’re from or what your income is; you don’t even have to ride. The only prerequisite is Respect. T o those of you who are currently serving and fighting for the freedoms of others, at home and abroad, please know that we are backing you. We honor and support you with every mission we carry out, and we are praying for a safe return home for all.